This study is focused on the semi-anadromous white perch (Morone americana), which inhabits both the Great South Bay and several of its tributaries. The species has been shown to influence its aquatic habitat through a variety of mechanisms, but very little is known about the ecological role of the fish in the Great South Bay system. Through the use of acoustic tagging and monitoring, this project will determine essential habitat, migratory pathways, and seasonal variability in movement. Trophic feeding levels and dietary preferences of white perch will also be investigated in this study. 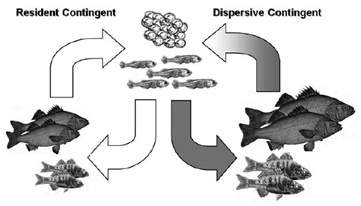 It is predicted that white perch will exhibit two types of behaviors. Some fish will be semi-anadromous, moving up and down the Carmans River, and perhaps occasionally entering Great South Bay, but will remain essentially resident in the river. Others will show population divergence through partial migration to other rivers and creeks. Assessing the proportion of the stock displaying each mode of movement, the seasonal patterns in these movements, habitat use, and diet will substantially improve our understanding of the ecological role of this fish and provide guidelines for its conservation and management. A total of thirty Vemco™ VR2W acoustic receivers have been deployed throughout the Bay, with fifteen in the Carmans River and 2-3 at the entrances of the Connectquot River, Browns River, Beaverdam Creek, Swan River, Champlin Creek, Carlls Creek, and Smith Point to Fire Island. 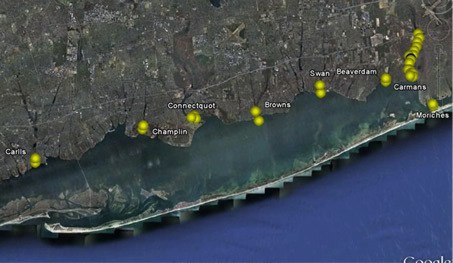 The receivers in the Carmans River provide 100% coverage from the mouth to Montauk Highway. The collection of white perch began in the Carmans River in early summer and currently twenty-five fish are tagged with Vemco V9 acoustic transmitters (along with six blue crabs). Tagged fish were released close to their collection location. A SEACAT SBE-16 profiler (Sea-bird Electronics) was also deployed in the Carmans River to continuously monitor temperature, salinity, and tidal level. There are currently plans to deploy additional receivers within the Carmans River, as well as Great South Bay inlet. More perch will be tagged this coming spring during their upriver migration. 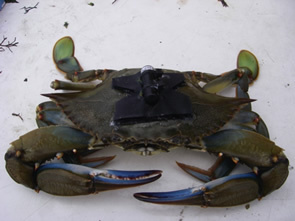 Tagged male blue crab. Photo by Matthew Sclafani.